You've played Magic one-on-one. You've played it in a free-for-all. But have you ever wanted to just throw down the gauntlet against all your friends at once? Have you ever wanted to take on the whole world and show them who's boss? Well, now you can! 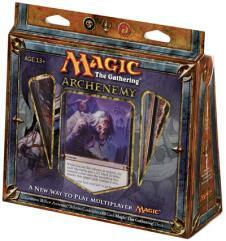 Archenemy is the first One vs. Many multiplayer product for Magic. With a deck of twenty oversized cards to beef up your favorite deck, you'll be ready to face off against as many of your friends as your kitchen table can hold. Two? Three? Twenty? Bring 'em on! Here you rule! On June 18, become the Archenemy! There will be four different game packs, each one with a 60-card Magic deck featuring eight rares, and a 20-card oversized deck. The living have held sway over the Multiverse for far too long. At your hand, flesh will surrender to the inescapability of the grave. The fallen will rise once again, and society's tenuous grasp on order will give way to the simplicity of rot and the beauty of decay. Filling graveyards with creature cards is a significant part of your strategy. And while this obviously includes killing opposing threats, you'll also have several opportunities to fill your own graveyard to great advantage. Use Zombie Infestation to discard expensive powerhouses like Avatar of Woe, and you'll set yourself up with a fantastic target for spells like Zombify. Of course, your enemies will probably summon fantastic beasts, stalwart soldiers, and weird flying things to stop you. Such distasteful disharmony. Fortunately, you can unite them all in death's sweet embrace. Your unholy arsenal includes spells with pinpoint accuracy like Terminate and ones that indiscriminately slaughter like Infest. Your schemes will help you overcome the mortal coil. Only Blood Ends Your Nightmares saddles one of your opponents with an unsavory choice, and death is the inevitable result. Once the graveyards are full, The Dead Shall Serve and My Undead Horde Awakens can give creatures a second chance at the battlefield, this time to do your sinister bidding. Extinguish them all, and show them the true power of the archenemy.